Mar. 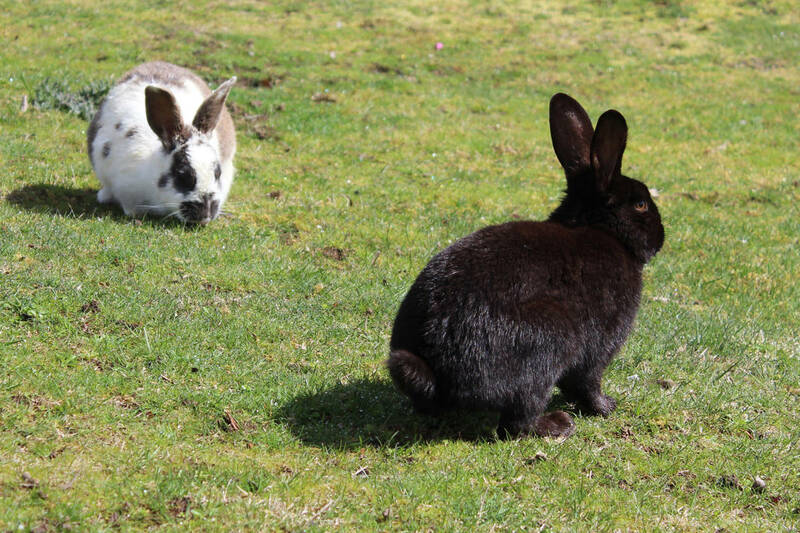 21, 2018 5:14 p.m.
Rabbit owners are being advised to take precautions after the province confirmed that a highly-infectious virus has killed hundreds of feral rabbits across B.C. B.C.’s Ministry of Forests, Lands, Natural Resource Operations and Rural Development issued a press release this afternoon after testing confirmed that feral rabbits in Delta and Nanaimo had died from rabbit hemorrhagic disease (RHD) — an extremely infectious virus that attacks blood vessels and organs. This is the third confirmed diagnosis of the virus in Canada and the first in B.C. Other dead rabbits found in the Comox Valley are being shipped to the provincial lab for testing. The Delta rabbits were found on Annacis Island and reported to authorities by North Delta resident Jeff Sawatzky, who told the Reporter that the warren was popular with workers from area businesses. “It’s just really sad because everyone loved these little rabbits. It’s kind of like the highlight of your day seeing these little guys,” he said. For Sawatzky, the death of the rabbits was devastating. They were more than just wildlife he saw everyday; they were his friends. He even gave the rabbits names, and said they would often come when called. “They would actually come right up to my hand and take carrots out of my hand,” Sawatzky said. “It was fun, you just go sit in the grass on a break or something and they’ll come right up to you,” he said. It’s believed there were as many as 15 rabbits in the Annacis Island colony, but only four have been confirmed dead as a result of RHD. Delta Community Animal Shelter manager Ryan Voutilainen said the city is monitoring the situation and working to get information about the disease to the public. Voutilainen said that anyone who comes across any dead rabbits should contact the shelter at 604-940-7111. So far, according to ministry’s press release, all the dead rabbits have been feral European or domestic rabbits, meaning pet rabbits are at risk. Pet owners should monitor their rabbits daily for signs of illness, and contact their veterinarian immediately with any concerns. The virus kills rabbits by affecting their blood vessels and attacking the liver and other organs, causing hemorrhages. Most affected rabbits die suddenly, but can show signs of listlessness, a lack of co-ordination, behavioural changes or trouble breathing before death. There is often bleeding from the nose at the time of death. Once infected, signs of illness occur quickly, usually within one to nine days. “By the time you know that your animal has it, they’ve either survived or most likely have died. That is why we are telling people who have pet bunnies, the most important thing right now is quarantine, quarantine, quarantine,” said veterinarian Adrian Walton, owner of Dewdney Animal Hospital in Maple Ridge. According to a fact sheet released by the BCSPCA, RHD can be spread easily through direct contact with bedding, food and water, as well as the feces and body fluids of infected animals. People, through their clothing, hands and vehicles can also spread virus to uninfected colonies, as can insects and wildlife that have contacted or fed on infected rabbits. Walton said the disease has a 95 per cent mortality rate, making the prevention pet owners’ best defence. Walton said there is a vaccine in Europe against the virus and that local veterinarians are hoping to get it in soon. “The vets of British Columbia have been working together to kind of figure if this vaccine is working, and some of us will be starting the import process probably next week,” he said. The disease is exclusive to rabbits and only affects European varieties. It is not known to affect native North American species. Humans and other animals, including dogs and cats, cannot be infected. While there is no threat to humans, the ministry advises rabbit owners not to move domestic rabbits into the wild at any time. As well, rabbit owners should take precautions when disposing of any rabbit remains. Because of the RHD scare, Rabbitats Rescue Society is having to relocate roughly 100 rabbits temporarily being housed in Delta while the group finds itself new headquarters. The animals were moved from the group’s previous home at the Richmond Auto Mall to Taisce Stables (the same business that housed evacuated horses during last year’s wildfires) but the presence of the deadly virus means those rabbits need to be moved yet again. “Basically, we’re worried that [if] they’re in a farm area … they’ll be more at risk of the fly and mosquitoes,” Sorelle Saidman, founder and director of Rabbitats Rescue Society, told the Reporter. The society has managed to find an indoor space for 30 of its adoptable rabbits with Urban Pets, a pet supply store in South Vancouver. The business will also host the society’s Easter Bunny Fest on Sunday, April 1st, but Saidman said the event will be a “look but do not touch” affair. However, according to a Rabbitats media release, the society has suspended its “bunny meet ‘n’ treats,” the rescue’s primary method of fundraising, until the situation is resolved. In the meantime, the group has taken steps to keep the remaining Delta rabbits safe. “We’re setting up bio-security measures of disinfectant shoe dip. You have to stand in a pan of disinfectant before you can walk into the area and we’re asking people to disinfectant their hands and allows change their close before coming to the rabbits,” Saidman said. Rabbitats’ sanctuary in South Surrey, which houses 120 rabbits, and the dozen or so bunnies still in Richmond are all staying put, at least for the time being. Rabbit owners are encouraged to consult with their veterinarian for more information about how to keep their pets safe, or review the SPCA fact sheet on rabbit hemorrhagic disease below.